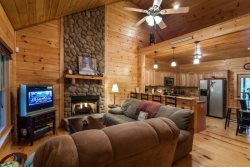 Nestled in the foothills of the North Georgia Mountains is where you'll find "Our Mountain Fantasy". This stunning home offers some of the most beautiful views available in the area. The covered porches provide a comfortable, cozy atmosphere and are gated to make it safe for children and pets alike. Experience the feeling of being perched in the treetops, the perfect place to observe a red tailed hawk or an eagle soaring effortlessly through the sky. Breathe deep, feel the fresh mountain air replenish the senses and awaken your inner spirit. Listen, as the wind gently whispers through the treetops, providing nature's perfect lullaby. Inside, the charm continues. A fully equipped kitchen with granite countertops, stainless steel appliances and a large dining table allows for some great meals with family and friends. The great room overlooking the magnificent views, provide beautiful, comfortable furniture, a gas log fireplace, and a 42" flat screen TV with DVD player. The King Master located on the main level is complete with a private bath and 40" TV. Upstairs, there is a spacious loft with a set of bunk beds, two more king bedrooms and another full bath. The terrace level is home of the game room with pool table with ping pong table top, air hockey and a 55" TV. A small room with game table for board games or cards is conveniently tucked away on this level as well. "Our Mountain Fantasy" is conveniently located in Ellijay, home of the famous North Georgia Apple Festival, antiques, river rafting/tubing, restaurants, and only 20 minutes from downtown Blue Ridge. So fantasize a little (or a lot) and call today to reserve your spot at this incredible mountain home! Linens for each bed, (2) bath towels (1) hand towel (1) wash cloth per person listed on reservation, dressers or closets for clothing storage, central heat & air, vacuum and/or broom and dust pan, mop, cable or satellite TV, internet, telephone for local calls. In addition we provide a complimentary start-up supplies of: Toilet Tissue (2 rolls per bathroom), 1 roll paper towels, 4 kitchen garbage bags, 1 hand soap for each bath and 1 hand soap for kitchen, dishwasher detergent, dishwashing liquid and laundry detergent for at least 2 loads. Many of our cabins include more than this basic list of inventory items. The only items you'll need to bring will be food, beverages, and condiments. Click on the "GET QUOTE" button for exact pricing. DRIVING DIRECTIONS TO THE CABIN ARE E-MAILED TO YOU 7 DAYS PRIOR TO ARRIVAL IF YOUR RESERVATION HAS BEEN UPDATED WITH YOUR GUEST LIST. Taylor in customer service was awesome. We booked a very last minute getaway and she helped us find the perfect cabin. For years I've rented off of VRBO, but since they were purchased and added an extra fee I now only rent through other sites. This cabin was nicely appointed and had everything we needed. It was very clean! We had an amazing weekend on Our Mountain Fantasy. The view is the best , and the cabin amenities are super. The service provide was excellent, fast response and smooth process. We've tried a number of different cabins through different management companies over the years and we always find we come back to Mountain Oasis and Our Mountain Fantasy. I can trust the cleanliness and lack of heavy perfumes I've run into at some cabins elsewhere, which is important for me with a great number of sensitivities. It's always just an amazing stay and Mountain Oasis goes above and beyond to prepare for us. We are ever so thankful! My family had a wonderful time in your beautiful cabin! All we needed to bring was ourselves and our clothes. Our kids had plenty to do with all of the games that you provided. Everyone enjoyed the hot tub as well! The scenery was amazing! Our Mountain Fantasy was a great getaway! It was the perfect place for three couples with views you cannot beat! Everything was well stocked and we had a blast spending time on the porches, hot tub, and in the game room. We really didn't need to leave! It was also convenient to hiking and white water rafting! Overall, really a lovely stay! Very Clean and well kept. Kitchen was very well stocked. Beds were comfortable and plenty of bathroom essentials provided . Loved the fact that all beds were king size. Porches were the selling factor for renting this particular cabin and they did not disappoint!! Very relaxing and plenty of room for everyone to have their own space or share breakfast at the table on the deck. Definitely a cabin to rent again; Ellijay is a wonderful location. We have now stayed with Mountain Oasis cabin rentals twice and both experiences have been wonderful. Everything from start to finish has been easy and stress free. I would recommend them in a minute and we will be using them for future trips! Thank you! We had a wonderful stay.thank you for the easy reservation process..check in and check out process..we appreciated the notes in the cabin..thank you for leaving supplies handsome laundry soap tp and paper towels. The kitchen had everything you could possibly need..past reviews on this property made it seem otherwise so I brought quite a few kitchen items with us.they were not needed. Very nicely decorated for xmas. Beautiful well kept cabin. Thank you! Our stay at "Our Mountain Fantasy" was perfect! We watched the leaves change color daily from our perfect mountain view. The outdoor deck was perfectly designed with gates, keeping in mind the safety of children and dogs. The home has everything you could ask for and more. It is impeccably decorated inside and out. From the porch swing, to the hot tub, to the game room, one never needs to leave. At the end of the week, none of us wanted to leave. If we ever owned a home in the Georgia mountains, we would want it to be very much like this one! Thank you for sharing your home with us! The home is wonderful! I never wanted to leave the porch. While we were there a friend noticed some of our photos on social media and booked the cabin! I loved we could bring our pups. There was firewood, propane, and each room was very comfortable. We plan on booking the same place again. For half the week it was just the two of us and then my sister in law came with her husband. We loved it!! Gorgeous view, fun family things to do (game room was awesome), dinners on the deck. Steep roads/driveway getting to the house but no 4 wheel drive needed. BBQ didn't work well. But really, no major complaints. It was a gorgeous house in a beautifully wooded area with amazing views and all the comforts of home. Highly recommend it! FYI... R&A Orchards is right now the road - great stuff! And a good Food Lion in Ellijay was close enough to get groceries. There are lots of restaurant options in the area too (downtown Ellijay - about 20 minutes away). This was a wonderful family vacation and this home is warm and full of love. You can feel the loving care that went in to furnishing and decorating it. It felt like we were visiting a real families home. Had all the amenities. Overall, this was a great place to spend quality time together. Lots of great parks and hiking in the area. Great place!!! Fantastic ★ ★ ★ ★ ★ They have everything you need. Everything! It's really clean when you get there, private, beautiful place to stay with a view and there's lots of little extra stuff too! We loved it so much. Thank you !! Mountain Oasis Cabin Rentals, Inc.